Thanks for dropping in at Schmidt Motors! As the name you can rely on in your search for the best auto component, Schmidt Motors has created a reputation of supplying you with the part you require to deal with whatever repair issue comes your way right on the first try. Taking this discussion to the next stage, doing business with our crew of trustworthy Chrysler, Dodge, Jeep, Ram, Chevrolet, Buick, and GMC parts experts means also having access to an abundance of insights and experience that you plainly will not find anyplace else. Whether you could use a bit of guidance on the correct part for the job or a little extra insight into how to get things into position, you can place your confidence in the reality that the Schmidt Motors crew of parts professionals will be ready to assist you through each phase of this procedure. Interested in learning more about why investing in OEM parts from Schmidt Motors is definitely the best choice? Then now is a fantastic time to take a deeper look into the perks of bringing your parts business to the customer-first group of experts located here at the Schmidt Motors parts division. Prior to diving headfirst into all of the facts related to why OEM components from Schmidt Motors are always your top option for restorations, it is a good idea to first bring you up to speed with what exactly "OEM" means. As the name suggests, only parts made exclusively by Chrysler, Dodge, Jeep, Ram, Chevrolet, Buick, or GMC, the genuine manufacturer, are worthy of receiving this designation. Even though other aftermarket companies might try and pass off their offerings as being of the same performance and durability as legitimate OEM parts, the reality of the situation is that the OEM part certification is a classification reserved solely for parts that conform to the brand's inflexible functionality and usefulness criteria. Setting a Formidable Emphasis on Quality — OEM equipment must go through stringent testing and inspection before finding its way to you, so you know that quality and performance will never be a concern with these selections. Made Precisely to Accommodate That Automaker's Repair Work — While other parts companies might appear to follow in the footsteps of OEM parts, there is simply no way around the fact that only authorized OEM parts from Chrysler, Dodge, Jeep, Ram, Chevrolet, Buick, or GMC are created precisely with the technical specs of your car in mind. Designed by the People Who Made Your Specific Car — The same group of men and women that built your favorite brand of car is also responsible for the groundwork behind the authorized OEM parts offered here at Schmidt Motors, so it stands to reason that it is undoubtedly a smart idea to obtain components straight from their team of licensed engineers. Backed by a Thorough Manufacturer's Warranty — The particular manufacturer's team is devoted to giving you peace of mind, so you can rest easy knowing that OEM components from them are always backed by a staunch warranty that shields you and your vehicle. The big key here? Buying OEM parts straight from Schmidt Motors means investing in your car's future — and ensuring the job gets done right on the first try. Now that we have covered what makes OEM components so great, it is time answer your last concern: Does Schmidt Motors have the right part for my Chrysler, Dodge, Jeep, Ram, Chevrolet, Buick, or GMC? Without a doubt, the answer to this inquiry is a big yes! 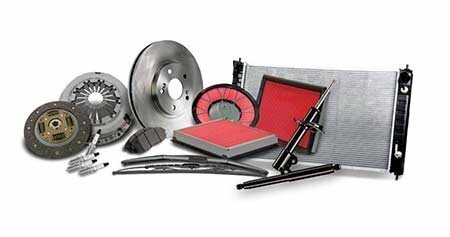 While this is just a small sampling of what we have to offer, there is no doubting Schmidt Motors's stock of OEM parts is head and shoulders above the competition in Ogallala. At this juncture, you are most certainly prepared to take the next step toward an effective vehicle maintenance and pick up the necessary OEM part for the task at hand. To get the ball rolling on this front, you have a couple of routes you can take. Up first, you can always stop by the Schmidt Motors parts department and have a member of our professional parts staff help you go through through the particulars of this crucial acquisition. Should the OEM part you require be available in our parts department's inventory, you will be able to take it with you following a brief visit; for all other products, we will be ready and willing to get an order in with the automaker and have the part mailed out as soon as possible. Should you want to undertake this process digitally, take a moment to look over our fast and easy OEM parts order form found below. After you do this, one of our reputable OEM parts pros will quickly set to work evaluating your inquiry and reach out to you to make sure you acquire the part required as soon as possible. We appreciate you stopping by the Schmidt Motors parts webpage, and we cannot wait to give you a chance to leverage the best assortment of excellent OEM offerings in Ogallala the next time you find yourself in need of a bit of assistance with an automotive repair task.